I hinted before that I would be writing at least once about Phish, a band that I had an obsession with for about five or six years. I loved all things Phish during that time. I wore an extremely dorky Phish baseball hat, wore out two consecutive tie-die Phish t-shirts, and eventually owned every studio album and numerous bootlegs and live recordings. Embarrassingly, I also received and read the Phish newsletter, something that both dates me as someone old enough to care about receiving newsletters and as a youth who clearly had too much free time. When I hit college, that mostly changed. My obsession died sometime during freshman year and never really rekindled, and I don’t really remember why. I think part of that shift in my listening life stemmed from a realization that while there may be some people just as into this music as I was, I wasn’t going to find them unless I was following Phish in an RV and going long stretches without bathing. My strange introduction to Phish as a recording studio band as opposed to a live hippie-jam act may have led me to enjoy the band on an arc rather than an oscillating line. Hoist was the first album I heard by Phish, and its polished sounds and tight compositions are at odds with the majority of their work, which centers on improvisation and extended jam sessions. I could probably talk a lot about each track, but you should really just watch the “making of” piece Tracking (1994). The film was shot and edited by the bass player Mike Gordon and is crude in terms of production values, but the sound (that I assume comes right off the boards) is high quality, and the film gives a nice glimpse into not only the endless work of recording track after track, but also the quirky recording process of the band and some of their improvised instruments (including a lemonade jug and rocks in cat litter pans). Unlike their previous albums A Picture of Nectar (1992) and Rift (1993) the sound on the album is highly produced, and there are plenty of songs that have the sound of a single that A&R people must dream of; it seems like this could have been a huge crossover hit for the band, but it sold only a respectable 1M records after two years. Hoist is star studded, with Bela Fleck playing banjo on “Scent of a Mule,” Alison Krauss singing a duet with lead singer/guitarist Trey Anastasio on the ballad “If I Could,” and my personal favorite, Jonathan Frakes (Commander Riker from Star Trek TNG ) playing trombone on “Riker’s Mailbox” (you can read about it here). All that fancification doesn’t really detract from the core quirkiness of Phish, and the album feels like a jam band taking a successful run at a polished studio album. I talked last time about equal talent in bands, and Phish has some equally talented members, but Trey Anastasio is far more equal than the others. Anastasio is a talented folk and blues guitarist who really knows how to throw down. My only problem is that he occasionally slips into lazy repetitions on long jam tracks, but that isn’t a problem on this album as the tracks are carefully pared down to their essentials (excluding the somewhat incoherent “Demand” at the close of the album). “Axilla [Part II]” is by far his best performance, and the tape of him recording in the studio was treat to watch. That alone almost makes me want to see Phish again, but it also reminds me of one of the main reasons I moved away from their music. By the time I reached college, Phish had already released live albums and more attempts at studio singles. When Farmhouse (2000) came out, it was clear that they were making an attempt similar to Hoist to cross over into the mainstream rock radio circuit. I had first encountered them on such an attempt ( Hoist ), but digging deeper I found a band that was deeply divided between extended improvisations in their live performances and their attempts to (re)create that atmosphere on studio recordings. I had too much history with the band at that point to accept their coming full circle, and while many of the people I met in college first encountered Phish through Farmhouse , my enthusiasm for their efforts of that type had already waned. Oddly enough, the internet, which has brought me countless hours of music enjoyment and allowed me to discover hundreds of bands that I would never hear otherwise, was partially responsible for my declining interest in this band. As a young man with a CD collection I got a variety of bluesy and experimental jazz-type tracks from Phish, but once I was a master of P2P file sharing networks I branched out. 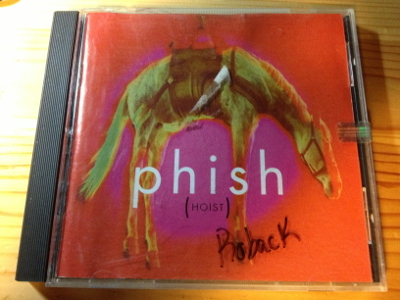 Through P2P, I sought out obscurities like The Man Who Stepped Into Yesterday and I even purchased some live recordings released in a massive series by Rhino (Phish did not tour central Illinois at all really, mostly stopping at Alpine Valley, which was far too expensive for me to drive up to in college). Alas, I couldn’t really sustain my interest in the band. My access to P2P sites ensured that I was able to have constant access to new music, relegating my CD collection to more of a secondary role (i.e. car rides and walking to and from classes/work). On a relisten, the album is somewhat ruined by the note-for-note knowledge of each track that I forged on many long car trips and many, many hours cutting grass. The songs are generally good and the performances are well meshed, but my enjoyment has waned considerably. Watching Tracking briefly reminded me what superb guitar and backing vocals there are on this record, but I don’t see myself listening to this, or really any other Phish record, again anytime soon.